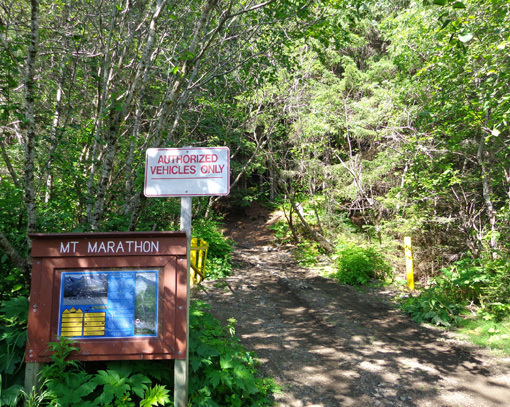 the race point on this steep mountain face by the general public is not recommended." Note that this short-but-challenging race draws so many runners from around the world who want to push their personal envelopes that lotteries are required to limit the number of men, women, and youth who are permitted to participate in the three race waves on July 4. Organized in 1915 on a bet, the Mt. Marathon event is the second-oldest foot race in the U.S. 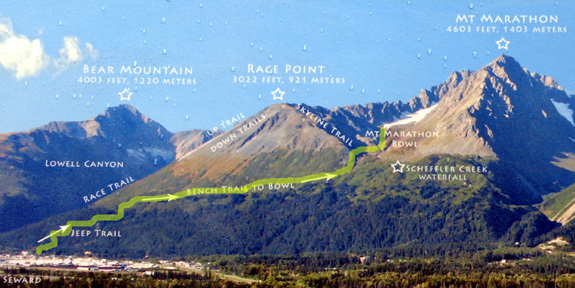 Runners face a 3,022-foot vertical climb in only 1� miles to the "race point" (not the true summit, which is over 4,600 feet elevation), an average 38% grade. As you can imagine, such a steep grade on loose, icy, wet rocks and cliffs is less dangerous going up than coming back down. 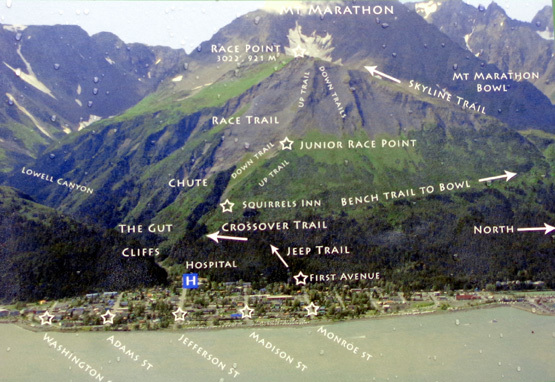 Most of the inevitable injuries in this race occur when runners are bombing downhill to the finish line in Seward. 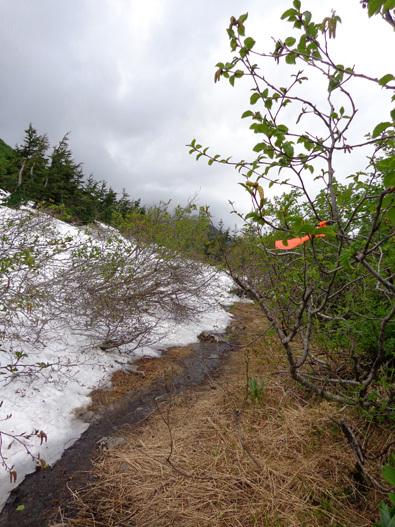 Fortunately, there are less treacherous trails on the northeast face of the mountains. As the signs warn, however, there are no safe trails on Mt. Marathon. Although I'm no longer able to run a race like this one I still like to challenge myself on mountains that are new to me and, yes, to take some risks. I've been itching all week for the opportunity to climb somewhere on the mountain. I just had to wait for the trails to be re-opened after this year's race tragedy had them closed for several days. DON'T WANNA LEAVE YET . . . 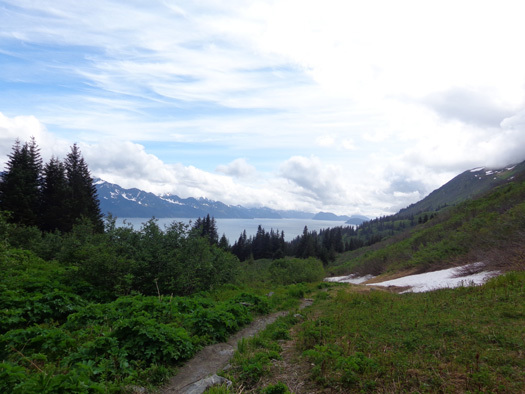 Yesterday we decided we wanted to spend one more day in Seward so we could go to the Alaska SeaLife Center, hike up Mt. Marathon (Cody and me), do another bike ride (Jim), do a bunch of laundry, and plan where to go next. Last-minute decisions are part of our MO for maximizing the flexibility we have in each location in Alaska that we decide to visit. That gives us the freedom to stay longer in some places if the weather is good and we have more things we want to do or to explore interesting places we learn about as we travel, e.g., or to leave earlier than we originally planned because of poor weather conditions or other reasons. 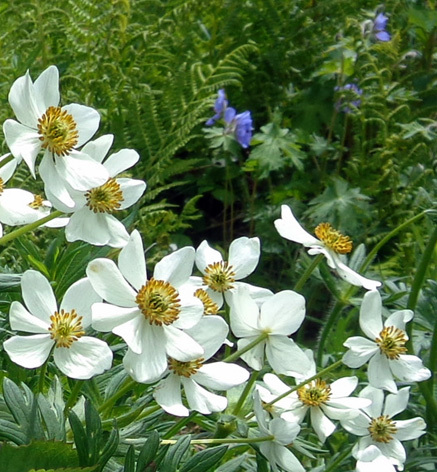 On our first trip to Alaska we simply don't want to be locked into a rigid schedule. This is more my idea than Jim's but he's a good sport. I know he'd be more comfortable with campground reservations made earlier than we're making them. 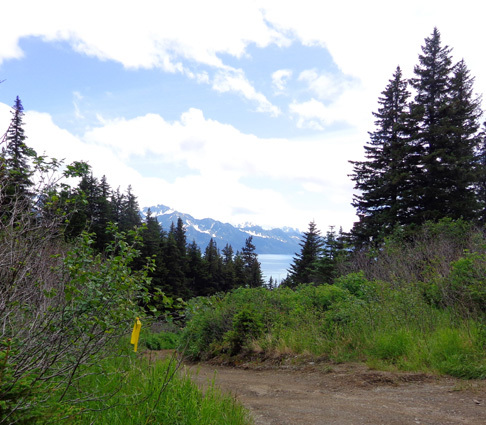 A few days before heading to Seward we called to reserve a campsite at the Seward Military Resort campground for three days. While checking in we were able to extend it to five days. Yesterday we wanted to extend another day because the weather improved and there were more things we'd like to do before we leave the area. 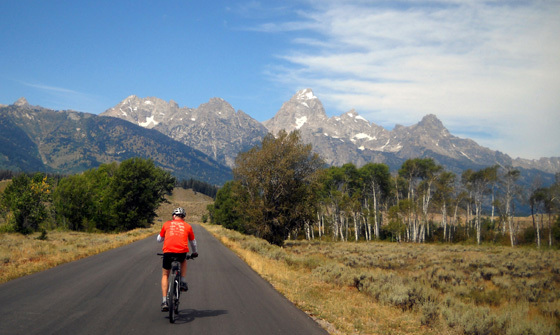 "Winging it" without campground reservations weeks or months in advance has its pitfalls, however, and requires both flexibility and resourcefulness. The modifications we made for today and the rest of this week (described at the end of this entry) describe how we handled two current challenges we encountered with full campsites. 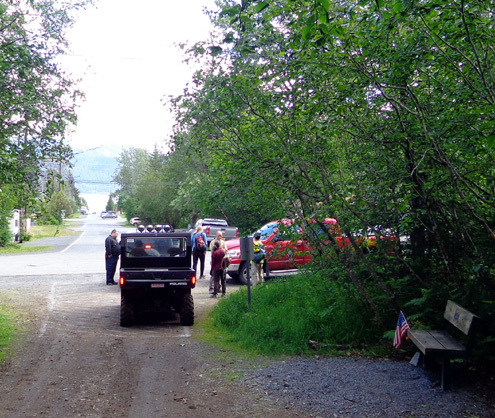 I noticed yesterday that the Seward Military Resort campground was filling up pretty fast all of a sudden and encouraged Jim to go to the office to add on another day. Oops -- too late. We had to leave by noon today because all the sites are reserved tonight. We walked across the street to the Air Force campground, which isn�t as nice as the resort but it�s our next best choice in this area. Fortunately, they had several suitable sites left. 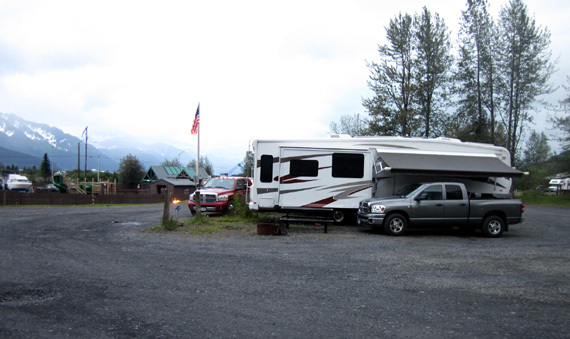 We got a back-in site, shown below, for tonight at $18 ($7 less than at the resort). We have 30-amp electricity and a threaded water pump behind us. There is a dump station and restrooms with showers. We can still do laundry at the resort next door. Advantages of this site are having more room and being able to see the harbor from inside our camper. We didn't have a view like that at the resort. 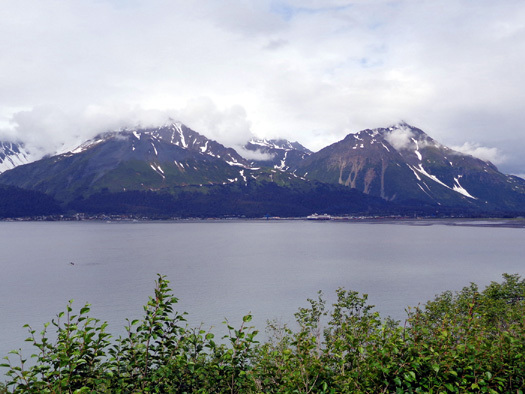 We moved to our new site after we went to the Alaska SeaLife Center this morning, got settled in, and continued enjoying Seward for a few more hours this afternoon and evening before it began raining again. After lunch I took Cody for a 3+ mile hike on the hikers' trail on Mt. Marathon. My goal was to reach the cirque between the peak where the Mt. Marathon race runners turn around and the real summit of the mountain. 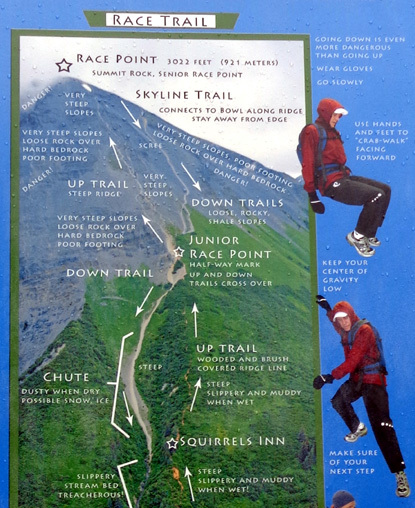 You can see those features in the next picture, also from a sign at one of the trailheads. 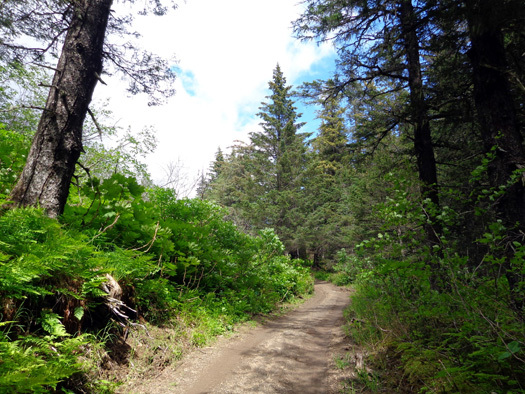 I had no illusions of hiking on either the uphill or downhill trails the racers use; those trails are too gnarly for me with Granny Knees. They are also a muddy, icy, snowy mess right now after hundreds of runners and search crews have been over them repeatedly in the last six days. 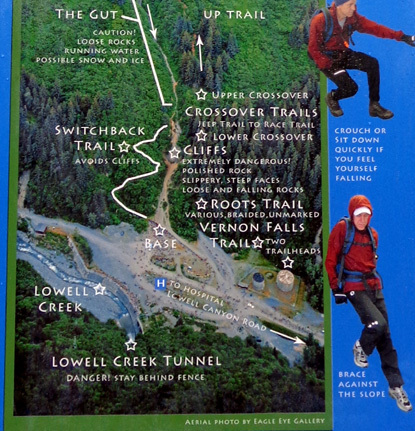 The route I took, highlighted in yellow on the photo above, begins with what the locals call the Jeep Trail. It is a longer route to the cirque and race point but much less treacherous than the trails used in the race. Above tree line the Jeep Trail connects to the Bench Trail, which leads to the bowl (cirque). I took Cody with me because dogs are permitted on this route; they are not advised on the gnarly race trails because of the danger of going over steep cliffs that are slick with ice, water, and loose rocks. We checked the hiker trailhead at First and Monroe this morning (next photo) to be sure it was open. It is, even though Michael LeMaitre, the runner who disappeared during the July 4 race, hasn�t been found yet. The search continues for him. I'll talk more about that situation at the end of this entry. 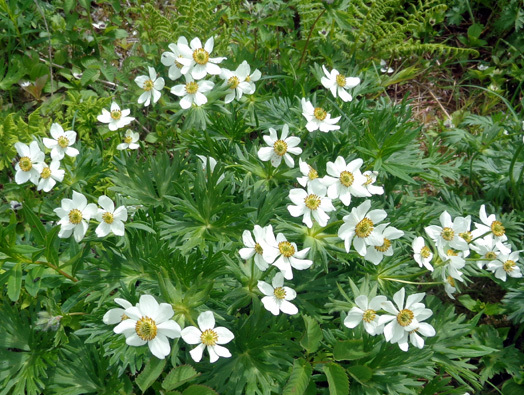 I met another half dozen searchers about half a mile up the trail; they chose to hike down. The various search teams have used different colored plastic tape to mark the quadrants where they�ve hunted for LeMaitre in the past week. There are dozens of blue, yellow, and orange ribbons up there to indicate the areas already searched so efforts aren't duplicated as rescuers continue to look for LeMaitre or his remains. It's a huge mountain to search. Even though this area isn't on the race course volunteers have expanded their search to the entire mountain in case LeMaitre got disoriented and lost during the bad weather on his way down the mountain. 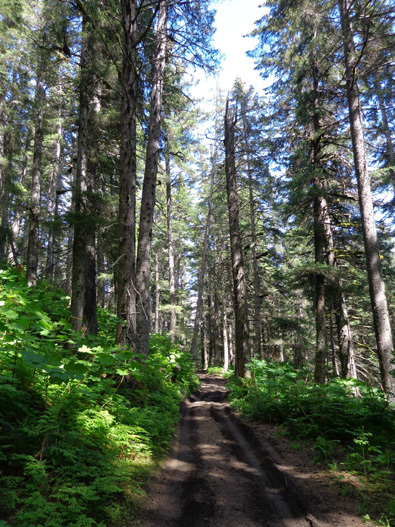 The first mile of the trail I was on today is a moderately steep jeep track with tall spruce, hemlock, pine, and cedar trees and thick, lower growths of ferns, alders, devil's club, and other understory plants on either side of the road. I gained about 800 feet elevation in that one-mile section, which was easier on my knees going up than coming back down. The higher I got above that point, the fewer trees and the more I could see of the bay.